July 8 is National Collector's Car day, and to celebrate, eBay Motors is hosting an auction that should break the site's record for the most expensive vehicle ever sold through the site. One of the nine remaining General Motors Futurliners is set to fetch millions of dollars on the site as its auction runs from June 8 to 18. This particular example has been meticulously restored by Peter Pan Bus Lines over a total of three years. The 400-horsepower leviathan is 33 feet long and just shy of 12 feet tall. When it was built for the 1939 New York World's Fair, it cost GM around $2 million in today's dollars. (Those of you with long memories may recall that a similar example shattered Barrett-Jackson records when it hammered at $4.1M in 2006). After the World's Fair, the 12 Futurliners toured the U.S. under the "Parade of Progress" banner, showing the nation the technology of, well, the future. Each bus opened up to display the science behind microwaves, jet propulsion and the like. This particular example was exhumed from a New York corn field in 1997 before being massaged back to life by Coach Builders of Springfield, Massachusetts. The bidding starts tonight at 9pm Eastern, but for now, you can head over to eBay Motors to learn more about National Collector's Car Day. I have heard of these over the years and would be one cool part of GM history to own. This popped up on another one of my forums earlier today so I started doing some research. I came across a website documenting the restoration of one of the Futurliners, and it's really cool. There's a LOT of material to read through, I'm still following the progress myself. These things are REALLY cool, if only I had the space and money. I've never seen one of these goliaths before! There was one of those at the Iola Old Car Show in Iola, Wisconsin last year. (That same show for this year started this past Thursday and runs through tomorrow.) I went on Thursday but they didn't have the Futurliner. That thing is epically massive. I couldn't quite comprehend it when standing next to it. They were letting people go up into the cockpit though! I didn't do it though, there was a line and we were on a time constraint. Wow! What a great piece of history. That's pure awesome! Especially love the old font and just about everything on this. 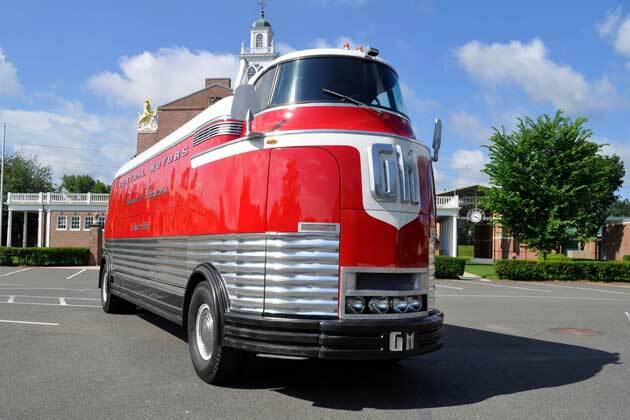 One of the last remaining General Motors Futurliner busses failed to live up to expectations at auction. Bidding on the restored machine started at $500,000, but after a week on eBay Motors, bidders had only managed to turn the volume up to $505,600. That's a tall stack of cash, but still well below the owners' reserve and under the estimates that said the Futurliner would fetch into the millions of dollars. Of the 12 original busses, only a handful remain, and one example recently brought home $4.1 million at Barrett-Jackson. This auction was supposed to break all previous eBay Motors records. What kept this particular piece of history from drawing similar money? It's difficult to tell. Maybe the previous auction was over-inflated or maybe there are only so many collectors out there with the means to care for a 33-foot long, 12-foot-tall beast of this nature. Perhaps part of the high-stakes bidding fun is being there live with the cameras rolling. At this point, it's unclear whether the owners will hold onto their Futurliner for a little longer or if we'll see it under the gavel one more time. General Motors built the Futurliner to promote a traveling show called the "GM Parade of Progress" in the 1940s and '50s. The slippery-lined bus, which was penned by the legendary Harley Earl, is one of 12 that traveled the U.S. to show Americans the future of motoring and technology. GM Futurliner #10, which was fully restored in 2007, recently made a trip out to the Pontiac Nationals in Norwalk, Ohio. The 30-ton, 33-foot-long bus was on display at the event, but that didn't mean that the massive antique wasn't allowed to also take a whack at the quarter mile. The 70-year-old sign of progress didn't exactly light up the tarmac, but it can hold its head up high for even finishing the run. The final time? 48 seconds at 28 mph. Follow the jump to watch the Futurliner in (slow) motion. 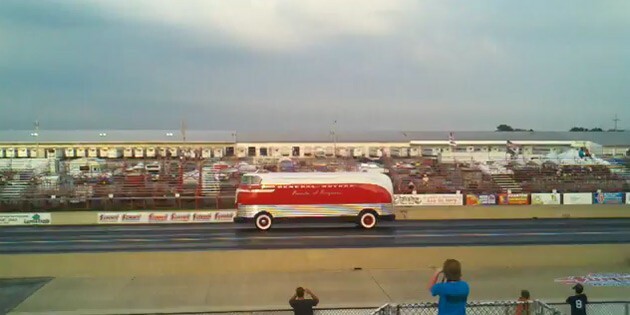 And no, your YouTube connection isn't running poorly... the Futurliner is powered a four-cylinder diesel engine (30 tons!) and only has a top speed of 40 miles per hour. Eat your hearts out boys. Here is a picture of my Lemans parked next to the NATMUS owned FutureLiner. This was taken at the 2008 Sloan Auto Fair in Flint, MI in late June. From what the NATMUS people told me, 12 FutureLiners were built, eight are still known to exist. At the time, this was the only working and fully restored FutureLiner in existence. It is powered by a straight-8 Buick motor tied to a Korean War-era tank transmission. I did go in it, it was well worth it. Let me know if you want to see pictures of the interior. The view from that high is amazing. I love the art deco styling too. One authentic display from one of the FutureLiner's resides in the GM Heritage Collection. For the 40s, it was quite amazing to watch this display flip to show automotive and social transformation of a rural farm community into a town while telling an interesting 10-15 minute story. The NATMUS FutureLiner was found in a farm field in western Michigan. Someone tried to turn it into a RV and then parked it. It was restored and is winter stored in Zeeland Michigan, since (as stated earlier) no one really has a garage to fit it. NATMUS (National Automotive and Truck Museum of the United States) is located in Auburn Indiana, right behind the Auburn-Cord-Dussenberg Museum. The FutureLiner does not fit in the building, nor could it support it's massive weight (without reinforcement). Both museums occupy former A-C-D buildings. I highly recommend that you visit both museums if you are in the area. It's the only place I've seen a Bonneville land speed record semi-truck....plus NATMUS has the very first Hemi 'Cuda ever built, built by Chrysler Engineering. That's awesome! Definitely want to see those interior pics! Those things are awesome though, I assume they built a display garage for it at the NATMUS location? I'm amazed that there are only 2 around now, then again I guess at the time they were only built for that purpose only so not much after use lol. I'm surprised GM didn't hold onto at least one though. I think there are 3 FutureLiners that are running. I am not certain if the one that crossed the block at Barrett-Jackson and this eBay are one and the same or not. I heard that the one that B-J sold was not 100% complete. It still had a lot of interior (display area) work to do. The NATMUS is 100% complete. I have no idea what NATMUS is doing as far as building a garage or modifying an existing building. They need money to do it, so I suspect they are still trying to secure or accumulate enough money to build one. I was there in November 2008, so things might have changed.